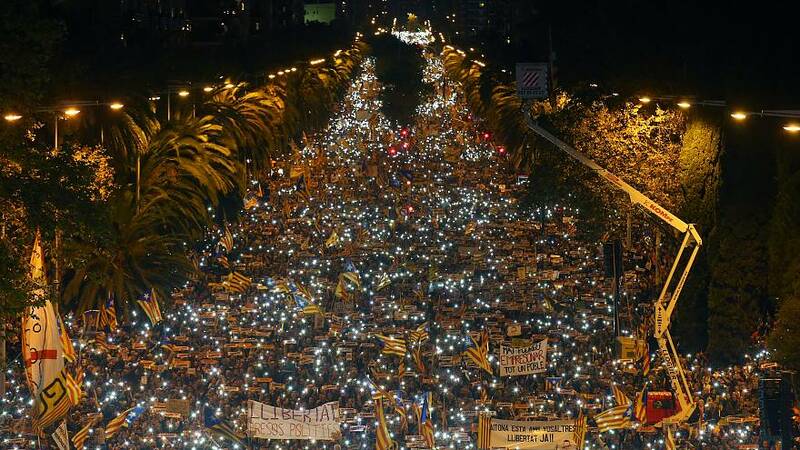 “Freedom for the political prisoners” was the rallying cry of up to three quarters of a million Catalan independence supporters on Saturday night. Wearing yellow ribbons on their lapels to signify support, they poured onto the streets of Barcelona to demand the release of separatist leaders held in jail for their roles in the region’s banned drive to split from Spain. Encouraging demonstrators via a video message broadcast on a giant screen was Carles Puigdemont, Catalonia’s ousted regional president, who was speaking from self-imposed exile in Belgium. There are question marks over Puigdemont’s leadership however with cracks showing in the separatist alliance. The party of his former deputy Oriol Junqueras want him as their candidate in December’s regional election. Junqueras will campaign from behind bars as he is one of eight sacked Catalan government members in pre-trial custody, accused of rebellion and sedition, after last month’s unilateral declaration of independence. The leaders of the two main pro-independence grassroots groups also remain in prison. In Barcelona on Sunday, Spanish Prime Minister Mariano Rajoy will campaign for his conservative Popular Party in the snap elections he called. Despite fractures among the separatists, an opinion poll this week indicates that pro-independence parties will win the largest share of the vote, although a majority is not assured.